Eric Ruske, joueur professionnel de cor a su s’imposer sur la scène internationale. Nommé associé principal de cor de l’Orchestre de Cleveland à l’âge de 20 ans, il fait des tournées et enregistre des albums durant 6 ans comme joueur de cor à l’Empire Brass Quintet. Son impressionnante carrière en soliste commença lorsqu’ il remporta en 1986 le Young Concert Artists International Auditions, le premier prix en 1987 de l’American Horn Compétition et en 1988, le prix le plus distingué du Concours International d’Interprétation Musical a Reims en France. De son enregistrement de l’intégrale des Concerti de Mozart avec Sir Charles Mackerras et l’orchestre de Chambre d’Ecosse, le New York Times a écrit : « L’approche de Monsieur Ruske, parfaitement équilibrée, cohérente et de bon goût de style classique, enchante par son assurance, son imagination et sa virtuosité éblouissante. » En tant que soliste Eric Ruske a joué entre autres avec l’Orchestre de Cleveland, l’European Camerata, l’Orchestre de Chambre de Toulouse, L’Orchestre Philharmonique de Seoul, le Baltimore Symphony, le Indianapolis Symphony , le Shanghai Radio Broadcast Symphony, L’Orchestre de Chambre de Hanovre, Le Boston Pops Orchestra, et a fait une tournée en Israël avec L’Orchestre de Chambre d’Israël. Il s’est produit en récitals au Louvre à Paris, au 92eme Street Y à New York, au Kennedy Center de Washington D.C., au Duke Hall de Londres, au Conservatoire Central de Musique de Pékin, et au Théâtre Mariinsky de Moscou à St. Petersburg en Russie. Il a aussi joué avec le Lincoln Center Chamber Music Society, aux Rencontres Musicales d’Evian, au Festival de Musique de Chambre de Santa Fe, au Festival de Musique de Santa Catarina au Brésil, au Spoleto Festival, au Festival de Musique de St. Barthelemy, aux Flâneries Musicales d’été, au Banff Center for the Arts, et au Festival Pablo Casals à Puerto Rico et en France. Eric Ruske, professeur très prisé, a enseigné dans plus de cent universités et conservatoires aux Etats Unis, il a notamment enseigné à La Royal Academy of Music de Londres, au Central Conservatory of Music de Pekin, au Royal Scottish Academy of Music and Drama de Glasgow, au Tokyo College of Music, a L’Accademia Nazionale di Santa Cecilia de Rome, au College of Music de L’Université Nationale de Seoul et plus récemment à l’Ionian Academy de Corfu en Grèce. En 2012, Albany Records a sorti un coffret de 7 CDs des enregistrements de Eric Ruske intitulé The Horn of Eric Ruske. Le coffret inclut Music by Three, un disque de musique de cor, violon et piano ; un disque de collection de cor intitulé Just me and my horn ; deux disques de transcription virtuose pour cor et piano, The Classic Horn and Virtuoso Music for Horn and Piano; un disque de concerti de Strauss et Glière, The Romantic Horn Concerti; la collection complète de concerti de cor de Mozart et un disque de répertoire de piano et cor intitule Night Poems. Il a également fait le premier enregistrement mondial de Concierto Evocativo pour cor et orchestre à cordes de Roberto Sierra. Ces nombreux arrangements et transcriptions sont maintenant disponibles chez Cimarron Music, notamment les Concerti de Mozart. Monsieur Ruske a grandi à LaGrange dans l’Illinois et a été étudiant de Dale Clevenger et Eugene Chausow avant d’être diplôme de Northwestern University. Mr. Ruske a reçu la distinction d’être admis dans le Illinois Hall of Fame, en 2007, en compagnie de l’architecte Ludwig Mies van der Rohe, du trompettiste Miles Davis et du comédien Richard Pryor. Il a reçu des subventions du National Philanthropic Institute, de la National Foundation for Advancement in the Arts, de l’International Institute of Education l’Institue National Philanthropique, et de Boston University. Eric Ruske est actuellement directeur du Séminaire de cor à Boston University Tanglewood Institute, et professeur de cor à Boston University. Horn soloist Eric Ruske has established himself as an artist of international acclaim. Named Associate Principal Horn of The Cleveland Orchestra at the age of 20, he also toured and recorded extensively during his six-year tenure as hornist of the Empire Brass Quintet. His impressive solo career began when he won the 1986 Young Concert Artists International Auditions, First Prize in the 1987 American Horn Competition, and in 1988, the highest prize in the Concours International d'Interpretation Musicale in Reims, France. Of his recording of the complete Mozart Concerti with Sir Charles Mackerras and the Scottish Chamber Orchestra, the New York Times stated, "Mr. Ruske's approach, firmly positioned with the boundaries of balance, coherence and good taste that govern the Classical Style, enchants by virtue of its confidence, imagination and ebullient virtuosity". Performances as soloist include appearances with the Baltimore Symphony, Indianapolis Symphony, Shanghai Radio Broadcast Symphony, Cleveland Orchestra, Jacksonville Symphony, European Camerata, San Diego Symphony, Boston Pops Orchestra, Kansas City Symphony, Seoul Philharmonic and a tour with the Israel Chamber Orchestra throughout Israel. His recitals have been presented in venues such as the Louvre in Paris, the 92nd Street Y in New York, the Kennedy Center in Washington D.C., Dukes Hall in London, and the Central Conservatory of Music in Beijing. An active chamber musician, he has appeared with the Lincoln Center Chamber Music Society, Santa Fe Chamber Music Festival, Festival de Musica de Santa Catarina in Brazil, Moab Music Festival, Newport Music Festival, Spoleto Festival, Festival de Musique in St. Barthlelemy, OK Mozart International Festival, Evian Festival, La Musica in Sarasota, Bargemusic in Brooklyn, Music from Angel Fire, Boston Chamber Music Society, and the Festival Pablo Casals both in Puerto Rico and in France. Mr. Ruske is in great demand as a teacher and clinician, and in addition to having given master classes at over one hundred universities and conservatories in the United States, he has taught at the Royal Academy of Music in London, Central Conservatory of Music in Beijing, Banff Centre in Canada, Royal Scottish Academy of Music and Drama in Glasgow, Tokyo College of Music, Accademia Nazionale di Santa Cecilia in Rome, the College of Music at Seoul National University and most recently at the Ionian Academy in Corfu, Greece. In 2012, Albany Records released a 7-CD box set of Mr. Ruske's recordings entitled The Horn of Eric Ruske. The set includes: Music by Three, a disc of music for horn, violin and piano; a collection of unaccompanied horn repertoire entitled Just me and my horn; two discs of virtuoso transcriptions for horn and piano, The Classic Horn and Virtuoso Music for Horn and Piano; a disc of the Strauss and Glière horn concerti, The Romantic Horn Concerti; the complete Mozart Horn Concerti and a disc of horn and piano repertoire entitled Night Poems. He has also made the world premiere recording of the Concierto Evocativo for horn and string orchestra by Roberto Sierra. His numerous arrangements and transcriptions, including a complete edition of the Mozart Concerti, are now available from Cimarron Music. A student of Dale Clevenger and Eugene Chausow, he grew up in LaGrange, Illinois and is a graduate of Northwestern University. Joining architect Ludwig Mies van der Rohe, trumpeter Miles Davis and comedian Richard Pryor, Mr. Ruske was inducted into the Illinois Hall of Fame in 2007. He has received grants from the National Philanthropic Institute, the Saunders Foundation, the National Foundation for Advancement in the Arts, the International Institute of Education, the Mattina R. Proctor Foundation and Boston University. 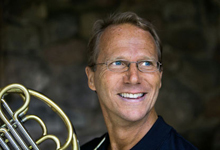 Mr. Ruske currently directs the Horn Seminar at the Boston University Tanglewood Institute and is the Professor of Horn at Boston University.